iKey, who has been known for 25 years for their innovation and toughness in the rugged world is now introducing the PDRT (Permanent Display Removable Tablet), becoming the world's first display with a built-in dock designed exclusively for the Panasonic Toughpad® FZ-M1. 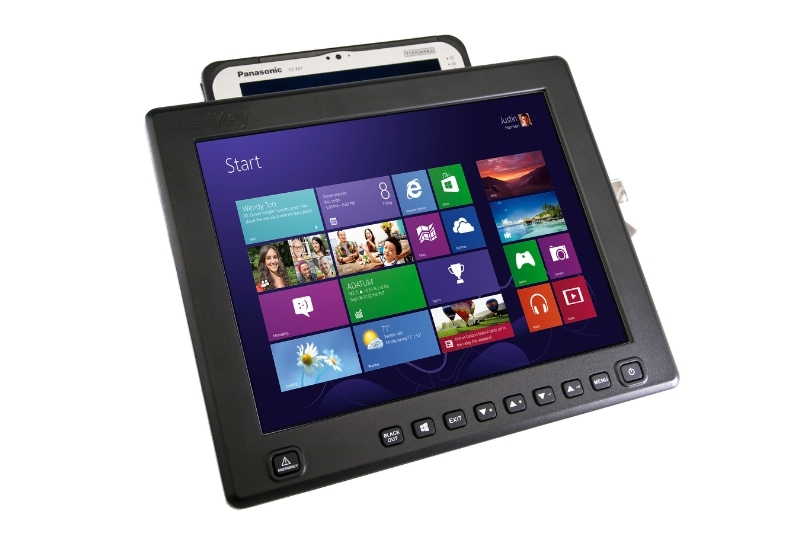 This rugged monitor is a high-bright, daylight readable flat panel display with a two-point capacitive touch screen, and integrated speakers. The touch screen has 8 to 1000 nits of brightness, meaning there is no glare or obstructions while working in bright areas. The PDRT also comes with an on-screen display control panel for easier setting adjustment and includes a one-touch emergency key. In addition, it features a standard VESA pattern for in-vehicle mounting. The VESA mount pattern makes it ideal for mobile, public safety, and fleet applications. Like the rest of iKey's rugged line of products the PDRT can withstand the harshest elements in any environment, and increase productivity and performance. "The PDRT is designed for customers working in areas where space is limited and an expanded workplace is imperative," said Steve Meyer, CEO, iKey. iKey has also included a lock for the Toughpad FZ-M1 after it has been inserted and mounted in the vehicle for added security, and a key to remove the Toughpad once all tasks have been completed. Built with user versatility in mind, iKey's new display allows for maximum capability of the Panasonic Toughpad FZ-M1, a rugged, 7-inch Windows tablet whether in the vehicle, or on-the-go. Panasonic's 7-inch Toughpad FZ-M1 is a rugged, thin, and lightweight tablet powered by Windows 8.1 Pro with two choices of Intel® processors. It has met the MIL-STD-810G specifications for resistance to drops (up to 5 feet), shock, vibration, altitude, humidity and extreme temperatures, as well as IP65 standards for rain and dust resistance. Other features include a daylight-readable, multi touch screen with glove touch technology and a Li-ion user-replaceable battery, bridge battery and optional long life battery. "Workers can't afford downtime when they are out on a job. iKey has come up with the PDRT which includes a built-in dock for the Panasonic Toughpad FZ-M1. The PDRT gives workers the options to choose how they want to incorporate it into their work day, on or off the field, 7-inch screen or 12-inch screen. This will keep workers mobile, efficient and productive," said Joe Martin, Director – Mobility & POS, Panasonic System Communications Company of North America. "The Panasonic and iKey partnership is an unbeatable combination of product performance." iKey will be presenting the PDRT at IACP 2015 in Chicago, Illinois at the McCormick Place Convention Center October 24-27, 2015 at Booth 4353. For more information on iKey's PDRT and our line of Panasonic compatible products, visit ikey.com, ikey.com/partners/panasonic/ or iKey's YouTube Channel for product demos and features. Follow iKey on Twitter (@iKeyKeyboards), Facebook, LinkedIn, and Instagram (@ikeyltd). About iKey, Ltd.: iKey globally designs and manufactures rugged, sealed keyboards, displays and pointing devices for industrial, public safety, medical and military applications. iKey is known as an innovator of customized industrial keyboards and computer accessories. Solving complex unique mobile and industrial data input needs for 25 years. iKey is the leader in the rugged keyboard industry, used in 88 countries and sold worldwide. For more information, visit www.ikey.com. 0 comments on "iKey introduces Permanent Display Removable Tablet (PDRT)"